A familiar sight to anyone using the Folger Shakespeare Library for research. In researching licensing in early modern England, I have been struck by just how bureaucratic the period was. To take Shakespeare and his company as an example for a moment, they would have needed a license for each play-text, another license to tour, a separate license to print, and a license for the theater itself. I find it strangely comforting to think of Shakespeare filling out forms between bouts of creativity. 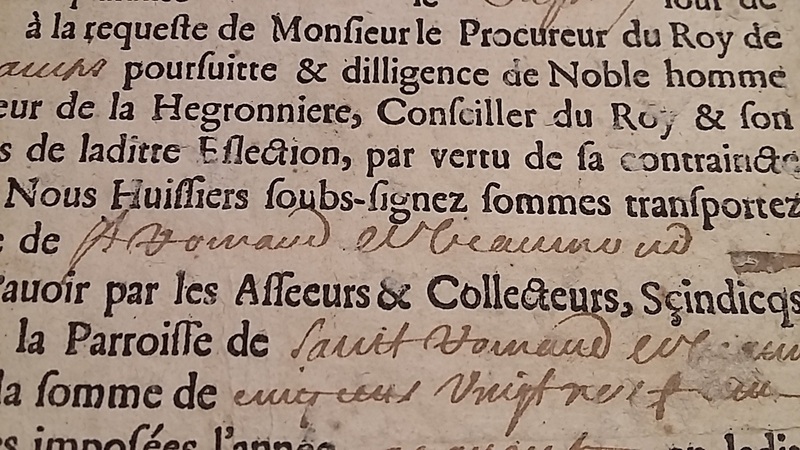 The need to carry paperwork was limited neither to players nor to England, and so I’ve been looking at a range of documents from the Folger collection, to get a better grip on how early modern forms were created, validated, and occasionally forged. 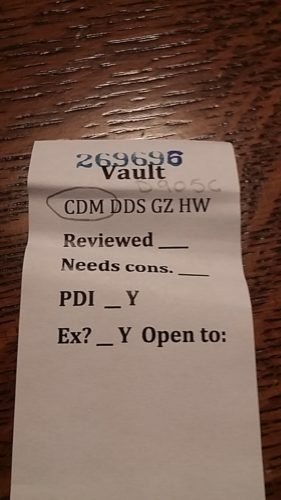 What follows is a look at some items with blank spaces left to be filled in, discussed at February’s Material Witness session. This is a new Folger Institute program where fellows are invited to ‘curate’ 8-10 items drawn from the Folger collection that are relevant to their current research, to open up discussion with the wider Folger community. 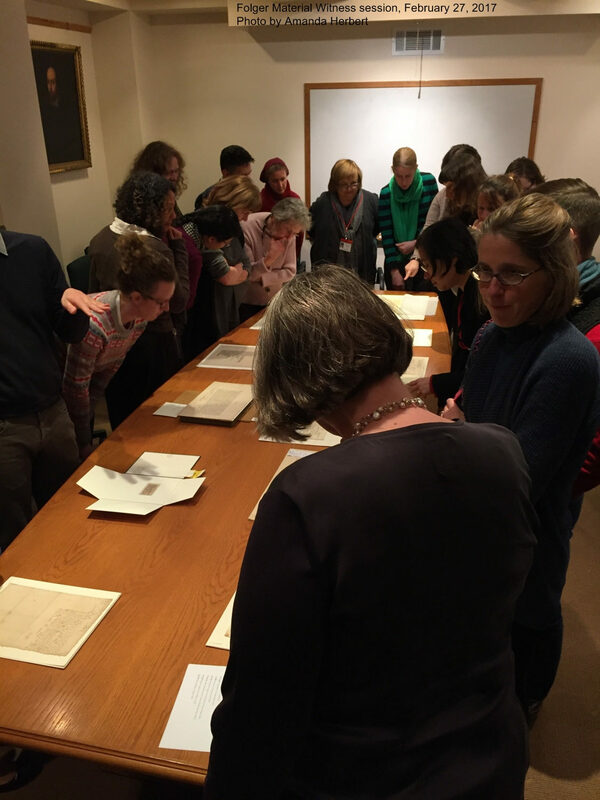 Material Witness session held at the Folger, February 2017. Peter Stallybrass has written that “the history of printing is crucially a history of the ‘blank.’”2 Creating spaces in printed documents to be filled in by hand was certainly a labor-saving development, but it also opened up gaps within the textual chain of command. This is not unique to print, as can be seen from X.d.70, a license to travel signed by James VI of Scotland for one Patrick, Master of Gray in 1600. While this license has been signed by King James, there remains several blank spaces left to be filled in. 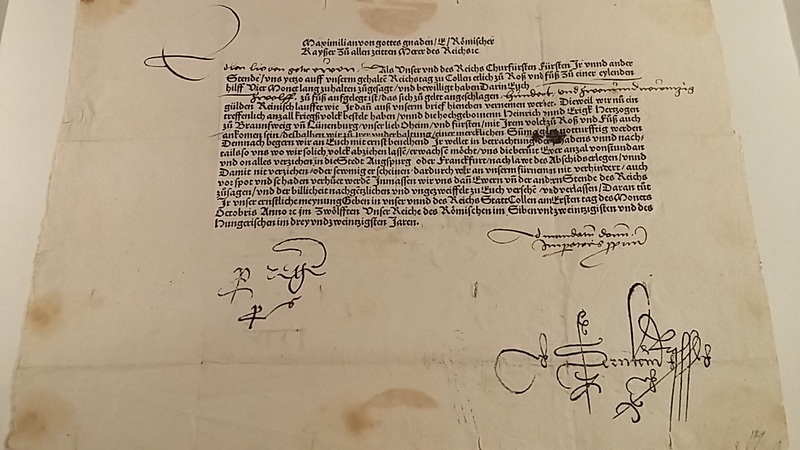 Here we see that the license has been signed by the king, while crucial details remain incomplete. 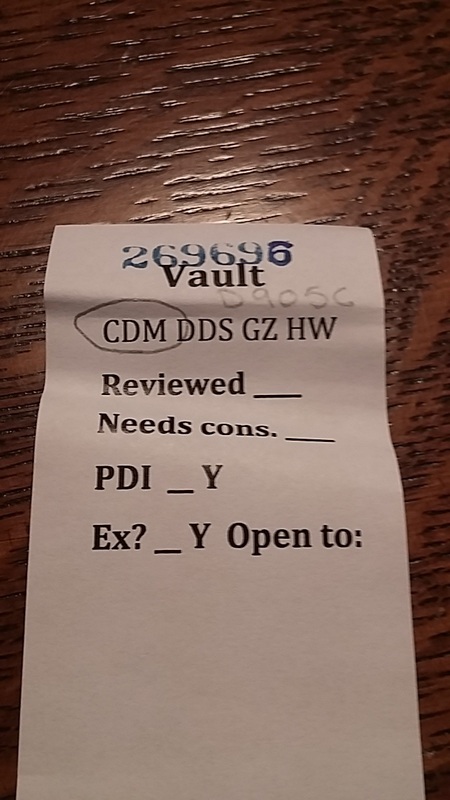 On the penultimate line it says that it was ‘signet [signed]At _____ the _____ day of _____’: details that were presumably to be filled in by a secretary or clerk. 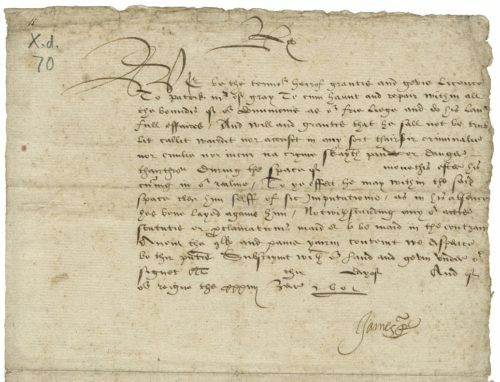 In the middle of the letter there is another blank space surrounded by text: ‘During the space of ____ moneths’: no doubt an important detail for the recipient. 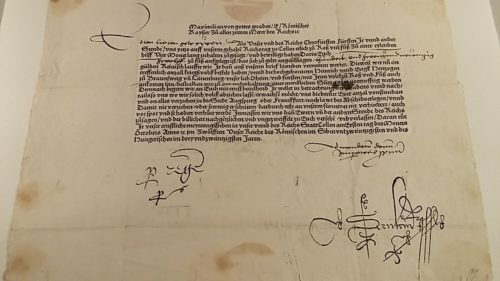 There is no evidence that this license was ever officially issued, yet it shows that the signature, even of a king, was not always the final stage in the creation of a document. 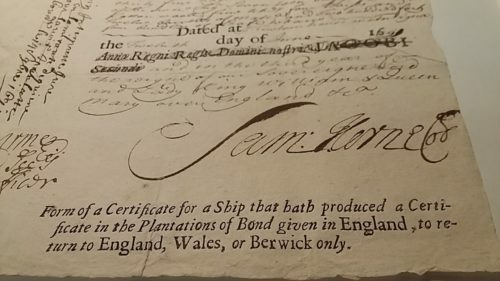 A more extreme example of emendation comes from a ship’s certificate, X.d.582, filled out in 1690, using a form whose printed details were out-of-date. The intervention of the Glorious Revolution in 1688 that saw James II deposed rendered the monarch’s name printed at the bottom no longer accurate, yet the document still carried his name in print two years later. When it came to sign off on the document, customs officials in Antigua corrected the relevant information by hand, replacing ‘Anno Regni Regis Domini nostri JACOBI Secundi’ with ‘and in the third year of the reigne of our Sovereigne Lord and Lady King William and Queen Mary over England.’ The heavy scoring out of the previous monarch underlines both the political stakes of every administrative act, and the fast pace of regime change in seventeenth-century England, with repercussions felt around the world. 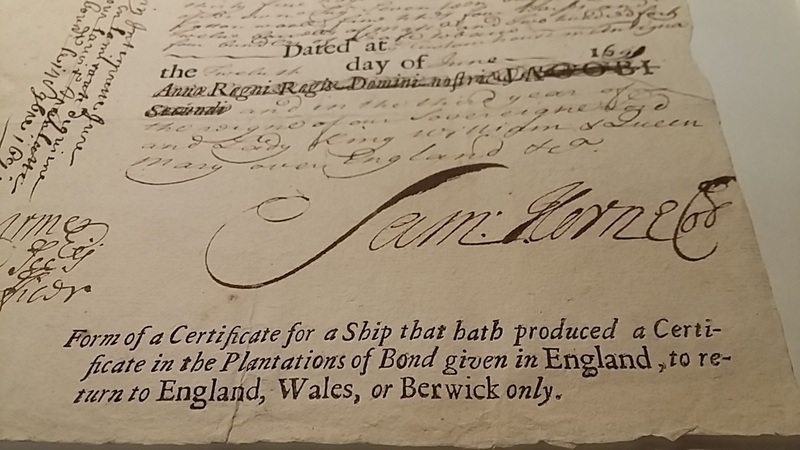 Lastly, we might note the tendency for paperwork to proliferate, with the description at the bottom stating it is a ‘Form of a Certificate for a Ship that hath produced a Certificate…’ Some things, it would seem, are impervious to historical change. 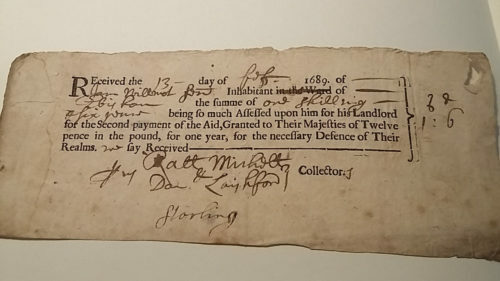 The Folger also holds an incredible cache of sixty-six contracts for indentured servants in the Americas, which offer further insight into the evolving practices of printed forms. In the example below (V.b.16 (no. 28)), for a servant named John Williams bound to Barbados in 1683, we see more and more spaces in need of filling in: the servant’s name and age, the term of indenture, the ship’s name and captain. Efforts have also been made to make the form gender-neutral, with a line in the middle specifying the master John Eaton ‘shall there Imploy H__ to the custom thereof,’ with ‘im’ supplied by hand. This is contradicted three lines later when the form has printed ‘to pay for his Passage in the good Ship the _______’3 Again there is a discrepancy in the printed date at the top ‘(1682)’ and the signed date at the bottom, ‘1683.’ Lastly, in the long manuscript addition after ‘In witness’ we can just make out that here too blanks have been employed. While the majority of the hand is consistent, the ‘19th’ before ‘day of May’ stands out as a later addition, once more alerting us to several stages of composition. While the scale of bureaucracy in early modern England was remarkable, other countries were not immune. New Folger acquisitions from the court of Emperor Maximilian show print and manuscript interacting in a number of different ways from the very beginning of the sixteenth century. In the example below, Accession no. 269695, we have the printed form filled in by hand, with extra penstrokes to fill up any blank space. In the bottom right corner, what appears to be a signature is in fact a woodcut—as manuscript supplements print in the body of the text, print approximates handwriting underneath. In England, Henry VIII is known to have used a dry stamp of his signature also, showing how bureaucracy has the potential to destabilize the line between print and manuscript. ‘PRINT NAME HERE’, indeed. When I consulted the second imperial mandate, Accession no. 269696, it came with the printed accession flag pictured. Here we see print and manuscript still operating in tandem, with the inked stamp of ‘269695’ amended by hand to ‘269696,’ continuing the rich cross-fertilization between media. 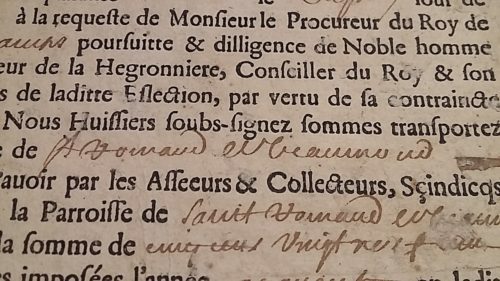 For a French example, the Folger holds a fascinating record of a citizen’s committal to prison for not paying his taxes in 1642, X.d.398. These examples show paperwork and its attendant blanks infiltrating every manner of government office, from England’s privy seal to the prisons of Paris. The geographical and chronological variety gathered here shows the ubiquity of form-filling over half a millennium. Blank spaces in both print and manuscript can make us more aware of both the collaborative nature of early modern writing practice, and the need to carefully parse the multiple stages of a document’s composition. What is the ‘date’ of STC 8475.5 above, printed in 1688 but completed in 1690? Printing, filling in, signing, and dating do not necessarily happen either concurrently or consecutively. Forms, with their prescribed boxes and assigned spaces, try to impose order on human experience, but often the human element cannot be so neatly contained. 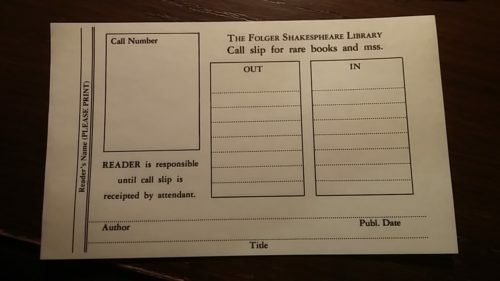 Looking back to the Folger call slip pictured above, it shows its limitations if details such as author, title, publication date or even call number are missing or unknown. The same is true of many of the examples collected here, whereby daily use supersedes strict adherence to the allotted space. Having included a tax evader from seventeenth-century France, I’ll finish with a different sort of blank space, one left for Death. 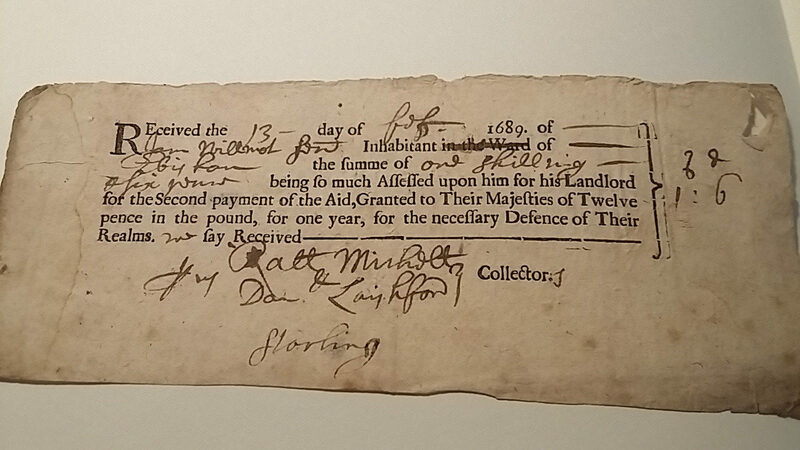 The Folger holds an early example of a printed bill of mortality, STC 16743.8, with numbers added by hand. How such documents were used will be the subject of a future post on The Collation, in conjunction with the forthcoming Folger symposium on Bills of Mortality. In life, there’s nothing certain but death and taxes. And forms. Printed bill of mortality recording deaths from plague and other causes, London 1609. 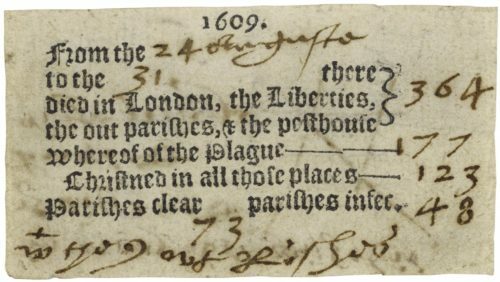 Derek Dunne is a 2016-17 long-term fellow at the Folger Shakespeare Library, working on a project entitled: ‘Rogues’ Licence: Counterfeiting Authority in Early Modern England.’ This study is on the links between bureaucracy, forgery and literary composition in the period. His first book, Shakespeare, Revenge Tragedy and Early Modern Law came out with Palgrave in 2016. Previously he has worked at the University of Fribourg, Switzerland, and Shakespeare’s Globe, London. What is an exit pass if not a passport—permission to travel from one realm to another, while the sign-in sheet that sits on the Registrar’s desk shares a genealogy with the parish registries of early modern England. On the gendering of forms see Laura Gowing, “Girls on forms: Apprenticing young women in seventeenth-century London.” Journal of British Studies, 55(3), pp. 447-473.